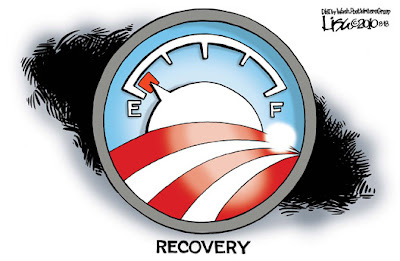 I cringe every time I hear President Obama talking about economic recovery when neither he nor any of his 'economic czars' have fully acknowledged that we are in a deepening Depression and that Obamanomics is running on empty. The Obama administration still seems unbelievably committed to a top down recovery where cash flush banks will loosen credit and the housing and credit bubble will inflate again. Guess what ~ it ain't gonna happen ! Here's what's really happening ~ Transnational corporations have made billions by moving 39% of US manufacturing offshore to boost the GDP and employment of foreign countries, such as China, while impoverishing their former American work force. Congress and the corpocracy have welcomed this as the New Global Economy ~ but it has left Main Street unemployed and over extended. Sales of US previously owned homes plunged 27 percent in July, twice as much as forecast, which is further evidence that foreclosures and limited job growth are depressing the market. For example, there have been 300,000 foreclosure filings every month for the past 17 months. This year, 1.9 million homes will be lost, down from 2 million last year. In July alone, 92,858 homes were repossessed. These are Depression sized numbers numbers ~ which cannot be covered up with wishful thinking or happy talk ! Let's start with the very real possibility of a permanent housing collapse. Shamus Cooke, writes in Truthout of that possibility ~ "The recent chaos that erupted when 30,000 people waited hours in the Atlanta, Georgia, heat to receive applications for subsidized housing is a mere symptom of a worsening national problem " and she's absolutely correct. Excerpt: " The housing market appears to be on a never-ending downward spiral, with the much-discussed "recovery" always around the next corner... The reasons that such a recovery is impossible at the moment should be obvious: millions of people do not have jobs; millions of others work only part time; millions more work full-time but make very little money; and additional millions fear losing their jobs... Under these circumstances, there can be no recovery in the housing market, which will continue to contribute to the broader depression-like economy in the US. " So what we need now are truth tellers as well as concerned citizens who demand truth and transparency ~ for without those two ingredients, a legitimate economic recovery will be impossible. Americans do not trust their political leaders, including Obama, who are obviously beholden to an out of control corpocracy and military industrial complex. Rasmussen Polls reveal " that only 23 percent of the people in this country believe today's federal government has the consent of the governed ... The major division in this country is no longer between parties but between political elites and the people," Mr. Rasmussen reports. On that very same subject, here's a must see video of Chris Hedges' one hour talk on HOW CORPORATIONS DESTROYED AMERICAN DEMOCRACY where Hedges explains how an American empire of production became an empire of consumption and how free market capitalism and globalization have economically brought America to its knees. Hedges uses the exploitation and demise of Michael Jackson as a metaphor for our present society of sound bites and illusions. Hedges also explains how Bill Clinton led the Democratic Party to the corporate watering trough and how NAFTA was the knife in the heart of the U.S./ working class. It was Clinton and Summers who destroyed the Glass/Steagal Act and put the Democrats in the same bed with the Republicans and Wall Street financial elite. Now 50 million Americans are in poverty and millions more are near poverty. The corporate state has hijacked our government and the actual unemployment rate is now closer to 20%. As Susan Cooke correctly states ~ " It will take a mass movement of working people to rearrange the priorities of those in power, or to put different people in power, so that the country's resources are directed to those creating the wealth, or in the most need of it "
It all starts,of course, with truth and transparency from our political leaders. We must mobilize and nonviolently demand it before the mid-term elections or we will eventually run out of fuel. Theodore Roethke wrote ~ In a dark time, the eye begins to see ~ So let's end our cultural retreat into illusion and demand the truth from our political leaders and effectively harness the corporate state in the process. Forty seven percent of the voters believe the Federal budget deficit is primarily due to the wars while joblessness continues to climb. The number one concern for a majority of people is the economy. It is the perfect storm for new organizing efforts to end the wars, cut military spending and rebuild our communities. Peace Action is helping to organize a national march on Washington, October 2, One Nation Working Together. We are calling on the Obama administration and Congress to create jobs and "move the money" from wars and weapons to our communities. Sign on, get involved and make a difference.